The cutest ladybug cakes! Red with spots and pink with spots...make a tiny one for a first birthday smash cake! Bake the size round cake you desire and let cool entirely. Cover with pink or red fondant and cut out black circles with a fondant cutter. Make a large round circle for the head. Cut out the eyes and attach. Using pipe cleaners, bend to shape antennas. Add some frosting grass or write the birthday child's name in icing. This cake was graciously shared by Jordan. Thank you for such a wonderful cake idea. Perfect for a Spring Birthday or Garden theme party. 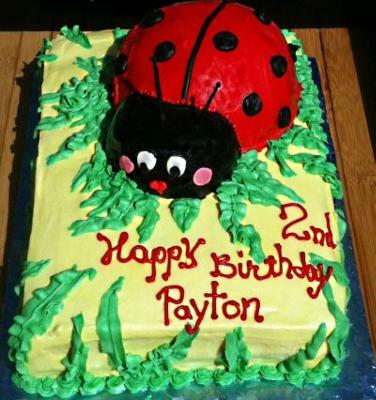 This cool ladybug cake was made using buttercream frosting and star tips to create texture and design. Here are some detailed how to's to make this cake. When I made the cake, I mixed up a boxed cake mix and baked it in a pyrex bowl (2.5 quart capacity), along with one cupcake for the head. I took the cupcake out of the oven after 25 minutes or so but left the big bowl in for close to 50 minutes. When it was done baking and had cooled completely, I evened out the flat part of the cake so it wouldn't wobble, and I cut the cupcake almost in half so that I could squish the bigger half up against the large dome. I froze it for 20 minutes to make frosting the cake easier. I covered the cake in a thin layer of canned frosting, filling in the space between the cupcake and the body with more frosting to create the shape of the ladybug head attached to the body. Then I mixed up a batch of buttercream frosting and colored it with food coloring paste in red and black (found at any craft store that sells cake decorating supplies) to decorate the ladybug. I left a little bit of white for the eyes. I used two different star tips to ice the cake. I used black pipe cleaners for the antennae. 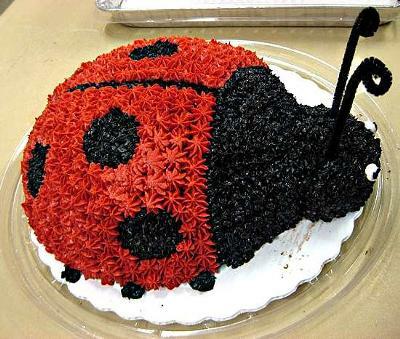 This exquisite ladybug cake has been generously shared by Sara. Here is a cool ladybug cake designed on a 9 x 12 rectangular cake base. Bake your favorite cake mix in a 9 x 12 pan. Let cool entirely before frosting. Yellow frosting was used to cover the entire cake. 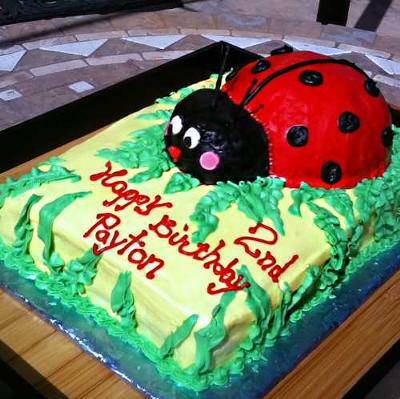 A half of the ball cake pan was used to make the ladybug's body and a cupcake was used for the head. Leaves were made with frosting and buttercream frosting to cover the ladybug. 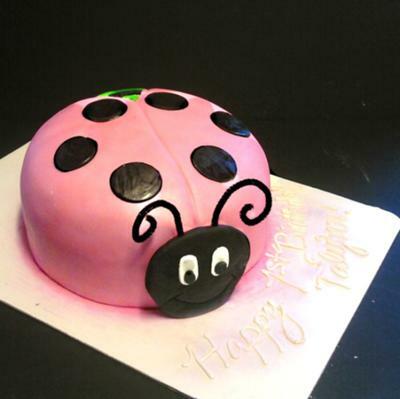 Write the name of the birthday child on the cake and you have a cute ladybug birthday cake! We were graciously allowed to use photos of this ladybug cake from Linda. Thank you for such a wonderful cake idea! 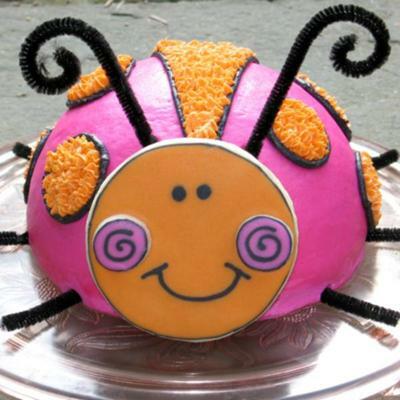 This brightly colored ladybug cake is sure to bring a smile to any child's face! It's simply adorable with it's whimsical pink body, orange spots and cute cookie head with antennas. A ball shaped cake for the body covered in bright pink fondant. The black spots filled with orange frosting applied with a icing tip and outlined in black. A decorated sugar cookie makes the head of the ladybug. Royal icing to decorate the cookie and edible pen to make the details. Thank you for this opportunity to share this wonderful ladybug cake. Be sure to see Leslie's other cute ladybug crafts! 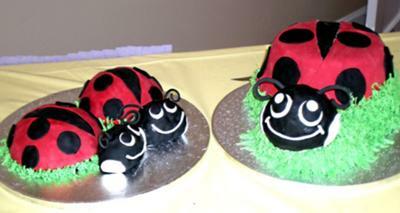 Take a look at these cool Mommy and baby ladybug cakes! The detailed tips are very helpful and can be used to apply to other cake ideas as well. The small ladybug cakes would make a cute Smash cake too! 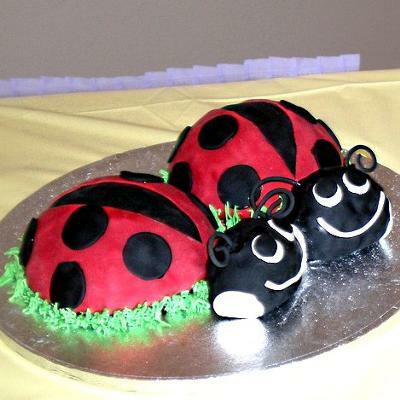 The ladybug cake is one of the best cakes to start making 3D cakes with. If you have an aluminum bowl you could bake right in there. Pyrex even works. For this particular cake I made the baby ladybugs using the Wilton ball pan. For the mother ladybug I needed a larger size so I stacked square cakes and carved until I was satisfied. After the cakes are stacked and crumb coated I used black fondant to cover the cake domes. I then used red fondant and covered the ladybug on top the black fondant. You just neatly carve away in a long and narrow triangle the red in the middle to make the appearance of wings so the black shows underneath. Using a circle cutter you could cut black spots and add that to the red wings. To stick fondant on fondant water is fine or clear vanilla extract. The head was made using rice crispy treats. The heads are rested on the cake board so you do not have to worry about supporting the weight of the head. The face details were made using white fondant and black fondant for the eyes. For the antennas you could use fondant mixed with tylose powder. This will allow the fondant to dry harder. I suggest making antennas at least 5 days ahead. Make sure that when you are making the antennas that a toothpick is inserted at the base. Add water to the toothpick portion that will be inserted in the antenna. Once dry this will be what is inserted in the head. Thank you Iman for such the wonderful, detailed tips on how to make your ladybug cakes!